The ride to Tamale was about 166 kilometres which would mean camping in the bush or finding a hostel to stay in on the way. We cycled steadily along on the first day and found ourselves a few kilometres short of Tamale to make it in the daylight but in a small town on the way. The town was lacking in two things we needed, a hostel and a camp site. After asking around, we realised there was nothing nearby. However, a friendly local said we could stay at his place. We would have to sleep on the floor (we were used to that after a few months on the road). We accepted. He looked like a decent enough fellow. Our passage into Ghana at the Paga border was unremarkable bar the drunken policeman on the road into leading away from the border offices. He was harmless enough but you never knew whether they were going to be 'friendly-drunk' or 'vindictive-dunk'. The roads were noticeably busy as we head through Navrongo and on towards Bolgatanga. What was noticeable was that neither of us was feeling great. For me, it was another stomach problem. What had we eaten this time and which bug had we picked up? The heat and humidity was becoming increasingly oppressive and added to the dehydration we were already suffering as a result of our illnesses. Dan and I limped into Bolgatanga and found a hostal to stay in. We had a large room with space enough for our bikes and kit. The hostal was clean enough and had a 'wriggly-tin' roof and surrounded a small courtyard. 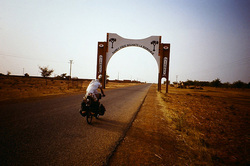 Making our way south from Ouagadougou, we could sense that the atmosphere was changing as we neared Ghana. The countryside was becoming greener and the temperature was rising as we headed towards the sea, which was still a long way to our south. We were heading out of the Sahel and crossing into tropical Africa. We made our way down the main N5 road towards Po, where we aimed to be by 9th January. We stopped in Kombissiri to drink tea and catch up on some writing, buying handmade cards of local children. The people were friendly and many of them carried tribal scars on their faces. Some of the scars looked horrific but other people's scars had a certain style to them. 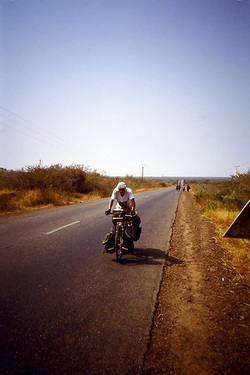 A particular aspect of Burkina Faso we were enjoying was the yoghurt sold in many places we cycled through. It was a dream after the plain food of Algeria and northern Niger. Ouagadougou was a nice enough, dusty old place, full of mopeds running you down and 'overlanders' complaining that “There's not much to buy here”. Our plan was to continue on the main road into Ghana, crossing the border at Paga, and then heading along the main road through Navrongo and towards Bolgatanga. From there, we planned to head south and onto the northern shores of Lake Volta. After recovering from my gut problems and a few days of rest, Dan and I spent some time walking around Ouagadougou. It's a much more relaxed place than Niamey. Despite being a dusty old town, the people are more friendly and easy going than the Nigerien folks we met. They are not constantly hassling you to buy their jewellery on the streets or asking whether our bikes are for sale, which is surprising considering that Burkina Faso is meant to be one of the poorest countries in the world. We tracked down a few nice places to eat and walked around an enormous market on one day. One of the local dishes we came to enjoy a lot was a tuna steak in peanut sauce. The variety of delicious fruit was overwhelming after living off tinned fish with rice for many of the last few months. The West African music blares out loudly from many bars; mopeds dodge in and out of the traffic, and fruit vendors on every street corner. People often come up and ask from where we have come, soldiers waving their weapons at us. On 6th January, we parked our bikes outside a bank and, almost immediately, came up to us getting annoyed while waving his rifle at us. We soon discovered that we had to 'pay' to park our bikes there. We paid him a small amount and he calmed down quickly! We phoned home for the first time in weeks and our stepmother, Susanna, answered. The relief in her voice was obvious and we realised something had been going on in our period of no communications to home. It soon became clear that our parents had thought that our silence was due to something terrible happening such as getting lost in the desert. Dad had called my future father-in-law in Botswana where he was working as a diplomat for the British Government to see if he could track down where we were. Fortunately, he could see that we had crossed the Algerian border into Niger some weeks before but that had been the last trace of us. Dan and I pointed out the lack of communications in the Sahara and Sahel region of Africa. The lack of population was matched by the lack of services such as post offices and telephones. We had also been too ill for much of the time to expend energy on writing letters, much as we would have like to have done. We had noticed far more wildlife in Burkina Faso than in Niger. There were many more birds and parrots than we had seen before, many of them very colourful. 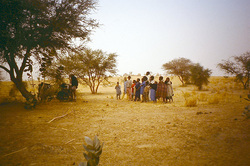 The terrain, despite still being the Sahel, was much greener too (apart from where the locals had stripped the woodland for firewood. Our next stage was to head into Ghana. We obtained our visas in Ouagadougou and got our kit ready in the camp site in preparation. 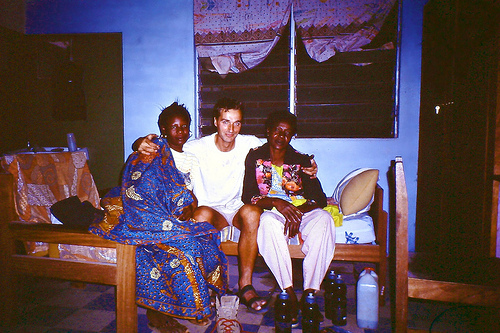 In Accra, we planned to meet with some friends of our parents who lived there. We thought about their washing machine and the prospect of clean clothes. On New Year’s morning, I was up early packing our kit away with the stove boiling water for breakfast. By 9am, Dan and I were passing through villages selling expensive bread, the border only 50 to 60 kilometres away. 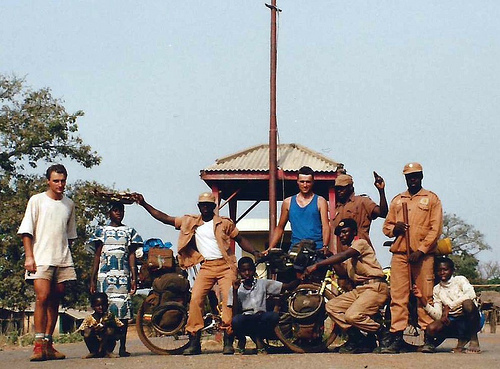 We came to the Niger border post, had our passports checked and stamped, had some ‘riz sauce’ for lunch and scooted off towards the Burkina Faso border post. I stopped at the border and took a couple of photos. Before that, an English pick-up, in which were two blokes we’d met in Niamey, came past and waved at us. 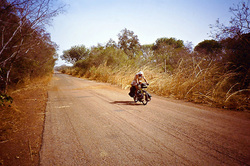 It was 240 miles to Ouagadougou, so about three days of riding. The ride to Burkina Faso's capital was fairly uneventful, apart from the fact that it was noticeably greener in this part of the Sahel and with more woodland (apart from where the locals had stripped it for firewood. We saw a lot more wildlife than we had done for some weeks. There were beautifully coloured birds, parrots and types of ‘shite-hawks’ in the trees and bushes as we cycled along the smooth, tarmac road. Once again, I was having stomach problems from eating or drinking something unclean as we neared the outskirts of the city. I had been trying to keep hydrated in between bouts of diarrhoea and finally thought I was feeling better as Dan and I came through the outskirts of Ouagadougou. For some reason, I decided that I was so much better that, while pedalling along, I raised my backside off my saddle to break wind. It was then that I realised that I was not better and had a ‘follow-through’. I had to cycle another few miles in a very uncomfortable state until we got to the campsite on the edge of the centre of the city. I was pretty weak again when we got to the site and unpacked. Dan had to put the tent while I went to get cleaned up. I came back to the tent and got straight into my sheet sleeping bag for the night. We left the campsite at 11am on New Year’s Eve and went into town, where we stocked up on bread, peanut butter, fruit, kerosene and a few other vital items for life in the saddle. We had lunch at a Guinean shack along with a Nigerien who had shown us around town and supposedly helped us to get things cheaper than other tourists. On leaving, a Frenchman beckoned us over to a shack he was standing next to which was selling ‘bijoux’. He invited us in for a cup of tea and sat us down. He talked at us a lot and told he bought jewellery here and sold it for a good price in Paris. He waffled on, showing us various trinkets while his Nigerien friend made some green tea. We drank the tea but didn’t enjoy it. This man was a bullshitter. We soon left and headed out of Niamey, past the police post and onto the road towards Torodi and Burkina Faso. We were 60 kilometres out of Niamey when we decided to camp up and settle down for a quiet night, thinking about everyone at home revelling and enjoying seeing the New Year in. It all seemed very distant. We could, however, hear lots of drumming from a village in the distance. The World Service lulled me to sleep. In the morning, we caught a taxi into Niamey (which cost 100 CFA francs each which is about 13 pence) where we had a culture shock changing moneyin the bank after the couple of months in the desert. We obtained our visas for Burkina Faso at the French Consulate and picked up our post at the Hotel des Postes. The post office was a nightmare. We could not get all of our post in one go. Each time I attempted to get all of our letters, the postmaster refused to believe that the post was for us. I could see a large envelope from Dad in a section of the post counter which the man had not even looked at. I tried three times to get the visible but elusive letters, each time getting some more letters of ours but not all of it. It was frustrating and I was starting to lose my cool. We decided to find a nearby café, have a coffee and calm down. Later, we tried again and were given all of our post. Niamey was full of contrasts. There were beggars and cripples outside the SCORE supermarket which stocked French food flown in especially for the expats in the country and which was incredibly expensive. Across the road from the supermarket was the 'Petit Marche', a collection of stalls selling anything from meat to soap powder. Some of the stalls had come across naïve tourists before and asked outrageous prices from us for foods we had bought for pennies on our way towards Niamey, and they refused to budge their prices. The further into the market we walked, the cheaper it became. We decided to go to the cinema to experience a movie in African style. We went into the 'Cinema Vox' and it was lived up to our expectations. We paid £1 each and went into the building where the floor was so contorted that it looked like the inside of a boat. The dubbed to French American film came on. The voices were out of sync with the film and the projector kept cutting out half of the picture. The film was scratched and distorted, people were jostling about constantly which made it all very amusing. We tired of it and left after about ten minutes. It was an action film. We, also, came across a French patisserie which had some delicious cakes to which we treated ourselves to one particularly big, sticky one each. Once outside, the kids came up begging for a piece of our cakes which was not so nice. Our consciences, however, did not get the better of us. Those cakes were too good and we had been living off tinned fish and rice for weeks. We had a guide book (Africa on a Shoestring) which was crap. It had recommendations for places to eat which we walked about for ages trying to find but didn't. We found a small place to eat lunch but it was not worth all of our efforts. We did meet two Americans and a Frenchman in the restaurant. They were staying at the Hotel Moustache (yes, seriously!) across the road. They recounted to us stories about the place; its prostitutes and illegal immigrants. One, Scott Evans, was a 20 year old who'd dropped out of university in Ghana and decided to to go travelling. He was a slow speaking Californian who moved to the campsite soon after and whom we got to know better. The other American was a 42 year old (his name I forgot) who had been travelling around Africa for a while. He seemed to be screwing his way around the continent and was proud of the fact that he had always used a condom. (Scott told us that he was sleeping on this blokes' floor for the time being amongst some of the used johnnies!). He continued to tell us that he got his money for travelling from conning people out of their money by sending children around to people's houses collecting money for 'charity'. He was clearly nuts. We left and bumped into Clive (who had had his Land Rover stolen) and got a taxi back to the campsite (for another 13 pence). At the campsite, we spent a lot of time talking with Eddie, Harriet, Clive, Aroha, Scott and two Canadian cyclists we had met, Gordon and Kirsten. Much time was passed over a couple of days just sitting about in the shade talking, eating papaya and coconuts, bread, butter and peanut butter. We had meant to do so much but Dan and I were so relieved to be eating some decent food and resting that we had no inclination to fix our bikes or to do cultural tours. 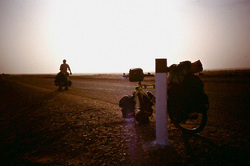 There was another Canadian cyclist who had been cycling around the world for four years. He had come down from Mali and had been in the middle of a gun fight where a man was killed right next to him. He had been in his sleeping bag at the time and had blood from the shot man all over it. He recommended that we did not go into Mali at that time so we changed our plans. 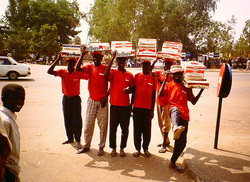 Travelling through Niger had left some striking memories in my head. The tall Tauregs in their blue robes, riding camels and carrying huge swords. The tribal scars on many of the people's faces, some of which were grotesque and some ornate. The salesmen selling trinkets (or trying to sell them) to us all of the time, whether that was in the campsite, the streets or in restaurants. The Harmattan wind blowing us all the way from Arlit. The wattle and daub houses in clusters with children rushing out of them shouting 'cadeaux'. At one point, I had knocked a boy over with my bike who misjudged my speed and stepped out towards me, after which I heard his machete clattering along the road after me. The number of termites and ants everywhere. The Frenchmen selling Peugeots or lorries to the locals. The 'riz sauce' dish which was our staple diet for lunch and supper for several weeks. On we went, the wind still following us through Dogon-Doutchi where we met some Kiwis in a Land Rover. It was a hole of a town. At lunch, we ate some rice and sauce from a stall before moving out of town a short way, finding a shady spot and finishing off lunch with fruit, coffee and a snooze. All the way into Niamey over the next few days, we bush-camped and saw a few local animals and insects on the way. One occasion was on Christmas Eve when Dan and I were sleeping away from the road. We went to bed in our sleeping bags, under mosquito nets and on roll mats only. On Christmas morning, we woke, ate and started to pack up to leave. Dan picked up his roll mat and saw underneath that it had been eaten away along its whole length. There were hundreds of holes on it, so much so that it looked like a moonscape but in yellow. The mosquito nets had been nibbled away where they had been touching the ground leaving great holes, certainly large enough to get a whole squadron of insects through in formation. Some of the clothes we had left on the ground had holes in them too. That was a Christmas morning to remember. On Christmas Day, we came into Dosso at lunchtime. Here, we bought some huge bananas, peanut butter (pate d'arachide), bread and a bowl of riz sauce. Later on, we came into a smaller town feeling a little miserable and tired, and looked to find somewhere to buy a fizzy drink to cheer ourselves up. While cycling around looking for somewhere to buy the drinks, some kids who had been jogging along behind us swiped a few of the bananas off the back of our bikes, which was infuriating. Now feeling very pissed off, we found a bar and entered after a near-argument with a man outside who said we could not go in. We ordered a beer each and sat down to cool off. There was a man singing and playing a home-made ukulele. He was very good although I didn't know what he was singing about. This was our first taste of West African music. After our experiences in Niger so far of people and children demanding 'cadeaux', or asking how much our bikes cost; a man sat next to us and started talking. He was very friendly and started buying us bottles of tonic water. We were very surprised but happy. We sat about talking for a while before making excuses and leaving. That night, we had difficulty finding a camp spot because of the number of villages about. We found one eventually after riding in the dark for a while. On Boxing Day, we rode the last 80 kilometres at a relaxed pace. The number of towns on the way to the capital was sparse so there was nowhere to stop to eat. We had to cook our own lunch and had pasta with tinned mackerel (which happened to be food-aid from Japan which was widely for sale in the markets). The final stretch into Niamey was a little dull until we approached its outskirts. Here, the local police stopped us, wrote in our passports and then chatted with us for a while. Most of the police were nice to us and we got no hassle compared to travellers in cars and Land Rovers. It was a long ride from where the police stopped us to the campsite, which led us through the middle of busy Niamey and out onto the north side to 'Camping Yantala'. We rode in, filthy, sweaty, smelly and unshaven. We must have been quite a sight. We filled in the forms needed to camp there, paid for one night and went in. The first people we saw in the campsite were Eddie and Harriet who we had last seem in Tamanrasset. We went up to say hello. Harriet came out of their tent looking pleased and surprised, noting how dirty we looked. We sat down after parking our bikes next to some nearby tress and talked with them. Eddie got some cold beers out which tasted great. We talked about their journey to Djanet (which took 9 days instead of the planned 5 days), a black guy they picked up who was walking up through Libya, our stories and also about a couple we had also met in Tamanrasset called Clive and Aroha who had their beautifully kitted out Land Rover and all their money and passports stolen by bandits who were posing as Tuaregs between Assamaka and Arlit. Clive and Aroha soon arrived, surprised to see us. Understandably, they were feeling very depressed but they cheered over the next couple of days. Aroha had, in fact, managed to stuff some cash down her knickers before they were forced out of their Land Rover. The bandits had shot at them to force them to stop. One of their grumbles was that their American Express Travellers Cheques, with a supposed guaranteed 24 hour replacement had taken five days to be replaced. In addition to this, they had to go to the UK Embassy in Abidjan in the Ivory Coast to get replacement passports travelling on a 'laisser-faire' pass. Poor sods. We ate that night at the campsite café and ate steak and chips with Harriet's Heinz tomato ketchup, which tasted fantastic, with a few beers. We didn't stay long in Tahoua and moved on quickly but my guts were still hurting. We cycled 90 kilometres from the town stopping at a few villages for breaks, drinks and fruit. For lunch, we ate the local rice and sauce dish which was filling but probably lacked much in the way of nutrition. My insides were still very painful and that night I was in agony and worse the next day. I could hardly breath or walk. Pain was shooting through my stomach and diaphragm. It got so bad that Dan had to stop a car which took me into Birni N'Konni, 40 kilometres away. When I was dropped by the driver at the hospital, nobody helped me with my bags and bike out of the car and into the building. It was obvious that I could hardly walk. I threw some abuse at a couple of men hanging around to help me out but no-one bugded an inch. I waited inside for a while amongst a crowd of parents with their muling children before being brought quickly up to the front of the queue to see a doctor (Was it because I was a white guy who could afford to pay for the treatment? Probably). The doctor got me to lie on a couch and, after a while, he pronounced that I had amoebic dysentery and prescribed Flagyl and Spasfon for the pain. The doctor gave me a lecture about Niger and Africa being poor and charged me his fee (I can't remember what it was but it seemed cheap). I limped out slowly, loaded my bike up with my bags and limped around to a nearby pharmacy before slowly riding my bike into town. I headed out to the road to Tahoua hoping to catch Dan on his way in. But, he came up behind shouting for me to stop. I was in agony. We soon found a campsite and went in to find a good shady spot. That afternoon, we lay about resting. In the evening, I slowly walked into town with Dan and looked about. Birni N'Konni was quite a busy little town, bustling all around us. We bought fruit and sat down at a table in a small stall for 'riz sauce' before painfully walking back to our tent. We stayed another day before I felt well enough to cycle and after a good spaghetti bolognese at the campsite café. The following day, our Swiss friends Danillo, Marco and Claudio turned up on their motorbikes. During the day, we changed money, walked through the market, the shanty town (with all its human excrement lying about). In the evening, we walked into town with two Germans we had met in Tamanrasset and, at one point, found ourselves surrounded by prostitutes from Ghana and Nigeria. Why there were quite so many of them in desolate town was a mystery until we learned that nearby there were uranium mines, so these girls provided the miners with a service to overcome their dangerous jobs. With AIDS rife, mining seemed the safer pastime. We ate with the Germans in a local restaurant. The next stage was from here in Arlit to Agadez, some four days away through the desert which would gradually turn into Sahel. We were to have the Harmattan wind accompanying us all the way to Ougadougou in Burkina Faso. There were times went in was in our faces which made cycling very hard. It was good to be back on the bikes after a few days of relying on getting lifts from the locals. Marianne, the Swiss girl who had stopped in the desert to give us bread and water stopped us on her way back over the desert and into Algeria to say hello and that she was glad that we had made it. 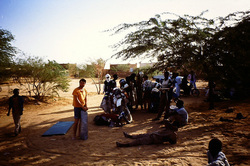 In Agadez, we met up again with Danillo, Claudio and Marco in the campsite. They made us upper that night and we sat around amusing each other and drinking beer. The next day, we went into town with them and sat around in a bar and ate lunch at 'Restaurant Chez Nous'. E ate a delicious salad and ragut. In the afternoon, we got our passports stamped by the police after dodging having to pay a 'Taxe Touristique', after which we went to a supermarket and bought strawberry jam which costs us a fortune but was worth it after the last four days of pasta and tinned fish. We stayed for a couple of days after the Swiss guys left and hit the road, heading for Tahoua. During this stage, we experienced some of the most sever sand and dust storms we had come across so far. So thick was the dust at times that I could not see 10 feet in front of me. Our ears and eyes became clogged up with dust and sand. Everything was covered in it. We passed four or five cut-down Range Rovers from Saudi Arabia which had falcons sat on the on a bar in the rear. We met a Bangladeshi chap that day who was helping the Saudis with their hunting. What a mix of people. In Agadez, had picked up another dose of diarrhoea which developed into dysentery in Tahoua. A Frenchman reckoned I had appendicitis, but I knew I didn't have that. I had terrible stomach cramps and the pain was in the wrong place. Tahoua was not a particularly nice place due to its bad atmosphere.